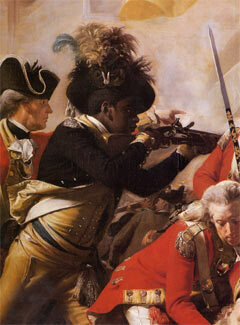 Detail from "The Death of Major Pierson," 1783, oil painting by John Singleton Copley showing a black servant fighting in the British Army in the Battle of Jersey, which took place January 7, 1781, on the Island of Jersey, one of the Channel Islands between England and France. The picture illustrates the phenomenon of black soldiers, such as those in Lord Dunmore's Royal Ethiopian Regiment, fighting as allies of the British during the American colonial period. Fighting in America, Dunmore's soldiers reportedly had "Liberty to Slaves" embroidered on their uniforms. Courtesy of the Tate Gallery. The painting depicts the British victory over the French in 1781 in Jersey. At a time when defeat in the American colonies was imminent, this victory became a cause for national celebration in England and crowds flocked to view Copley's painting upon its public exhibit in 1784. During the American Revolution, the presence of former slaves and black soldiers in the British army was a controversial topic in England. American sympathizers like the British statesman Edmund Burke violently protested the practice of luring slaves into the British forces. In contrast, loyalists like Samuel Johnson combined anti-American with antislavery sentiments. "How is that we hear the loudest yelps of liberty among the drivers of negroes?" asked Johnson in 1775. The British had initially taken possession of Florida in 1763, a decade before the Revolution. At first, they tried to stop slaves from escaping to the region. When war broke out with the Americans, however, the British changed their policy. After 1775, they agreed to grant freedom, land, and military commissions to all blacks who took up arms against the rebel colonists. America's Founding Fathers may have been fighting for liberty, but their definition was too abstract for thousands of slaves, who chose British freedom over American ideals.